This is something I hear women ask me all the time and the good news is there is plenty you can do to improve your egg quality. Many women may have had their AMH level tested and been told they have poor ovarian reserve. It’s important to realise that when you are told this, it doesn’t mean that you do not have enough eggs left, it means that in some cases the eggs are no longer capable of maturing every month in order to be fertilised. This is referred to as poor ovarian function. When I look at my experience of treating women who have been told categorically that they won’t fall pregnant, even with the assistance of IVF due to their eggs. I have seen in case after case that when these same women look after their health, change their diet and life style habits, take homeopathic remedies and herbs, then, they are able to fall pregnant naturally. Our eggs need to be properly nourished to mature, ovulate, fertilise and implant to make a healthy baby. The common misconception is that the health of your eggs is 100% down to your age. New emerging research suggests that women can produce new eggs throughout their reproductive years, despite being told they have premature ovarian failure. The health of the egg is important because it affects whether ovulation and fertilisation takes place as well as the ultimate viability of a pregnancy. Age is the main influence on egg health. This means that protecting the eggs you have as well as encouraging ovarian health through diet, homeopathy, herbs, supplements and increased circulation to the reproductive system is key. Of course ovarian health cannot be increased beyond natural laws, but a woman should be able to get pregnant until she goes into natural menopause, which for the average woman is around age 50yrs. This is what women are biologically designed to do. What most people don’t realise is there is a lot you can do to support the health of the ovaries and eggs but it needs to be done for at least 90 days in advance to have an impact. This is because the life cycle of an egg is 90 days. During the cycle of an eggs journey towards ovulation, there is a window of opportunity, a period of time, when certain factors can affect the health of the eggs that are preparing for ovulation. Preparation is key, you wouldn’t run a marathon without training for it and improving the quality of your eggs is no different but unfortunately we live in a society that expects things to happen immediately and this mind set does need to change slightly. Drink 2 litres of pure filtered water each day (not from plastic bottles or tap water) I use a filter on my tap at home from the Fresh Water Filter company. Exercise regularly, this increases blood flow in the body by bringing fresh blood to all the cells and helps to oxygenate the blood. For example you could play tennis, walk run, dance, do fertility yoga and go swimming etc. Get regular massage – one of the best ways to increase blood flow to the reproductive system is by massaging the uterus and ovaries. 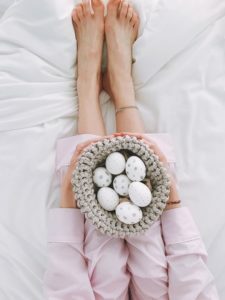 If you don’t have optimum hormonal balance overall, irrespective of whether you’re going through IVF or not, it’s going to affect the quality of the eggs that are ovulated and therefore the quality of the corpus luteum and that in itself is going to affect the quality of the lining of the endometrium for a particular transfer to occur. As far as creating the endometrium lining to be the best quality it needs to be for you to be able to conceive and implantation to occur and pregnancy to occur, preconception preparation is going to be vital. The quality of the egg and sperm today, is essentially what’s happened, well over your lifetime, but predominantly in the last 4 to 8 months. It actually takes approximately 8 months for the egg to go from primordial follicle to actually be the follicle that’s ovulated and what that essentially means is that in order for you to release an egg, that process begins quite a lot before the egg is even ready to be fertilised. Balanced hormones are essential for good egg health. Due to environmental factors, stress, and modern diets, more and more women are becoming hormonally imbalanced. If hormonal balance is off, the eggs may not respond, the cycle gets out of balance and ovulation may not occur. There are so many different aspects to the fertility cycle and much like in an orchestra if one instrument is off the whole sound isn’t good. But there is good news; balancing your hormones is possible with some individualised homeopathic treatment. In fact one of the reasons I even became a homeopath in the first place is because I could see how easily hormones came back into balance as a result of homeopathic treatment. Improve your liver health, one easy way to start doing that is having hot water and the fresh juice of half a lemon each morning to flush out the liver. Eat healthy fats for cell membrane production like coconut oil, raw olive oil, avocados, nuts and seeds. I have found that stress is a huge factor and it’s two-fold. Not only can stress often be a causative factor of the fertility problem itself, but the stress of trying for a baby and the monthly disappointment of not falling pregnant can also compound the situation and become a maintaining cause. If you are trying to improve your egg quality reducing your stress level should be a major focus in your life. Start by having an honest word with yourself, is there space in my life for a baby to fit in or am I just cramming it with work commitments and other things. Sometimes it’s just as simple as scheduling me time in your diary for just being, relaxing and doing what you want. I always say to my clients you need to mother yourself before you can become a mother and that means putting your needs first, especially when it comes to making time for relaxation. A recent UK study of 274 women aged 18-40 who were trying to conceive showed that women with higher saliva levels of the enzyme alpha-amylase (an indicator of stress) were 12 % less likely to conceive during their fertile time than those with lower levels. Australian Bush Flower essence – Black-eyed susan – If someone is impatient, constantly on the go and continually striving and so needs to slow down and find inner stillness..
Australian Bush Flower essence – Crowea – If someone is continually worrying, anxious and are feeling not quite right this essence will bring peace and vitality and will balance the individual. There are also two useful Australian Bush Flower Essences combinations: ‘Calm and Clear Essence’ for relaxing and unwinding; and ‘Dynamis Essence’ for exhaustion from stress and anxiety, plus Ian White states that each of the individual flower essences in the Dynamis Essence combination is aimed to support each one of the endocrine glands. Support Your Ovaries with a good diet and Antioxidants.